The iconic Polly Pepper, musical comedy superstar of yesteryear, is experiencing a bit of a professional dry spell-- she can barely keep her bank account afloat, let alone her career. So when the nefarious Laura Crawford, scene-stealing former cast mate and perpetual diva, proposes a Polly Pepper Playhouse reunion cruise, Polly is on board, full-steam ahead. But she soon realizes that Hollywood on the high-seas will be nothing short of a shipwreck. . . Packed to the gills with has-beens, D-listers, and sycophantic fans, Polly's celebrity cruise is really a ship of fools, and it's sinking fast. 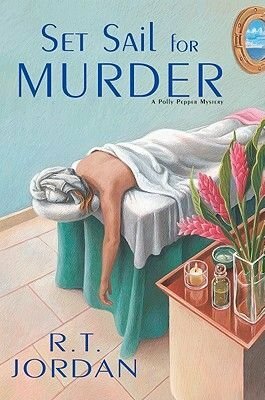 If that weren't enough, Polly's tiny room, troubling lack of champagne, and mandatory appearance schedule leave her feeling more than a little murderous towards Laura. Unfortunately, that ship already sailed Laura is found dead the next morning, slain by Season Six of "The Polly Pepper Playhouse" box set--the collectors DVD ruthlessly sharpened to a razor's edge. Polly immediately begins fishing for clues, and her first big catch is pianist-at-sea Lawrence Deerfield, whose career sank when Laura maliciously cut him from a recent stage production. But Polly will have to cast a wider net to catch this killer--with a ship's worth of burned cast mates, spurned lovers, and obsessed fans there are plenty of other motives in the sea. When Polly herself is accused of the crime she knows it's time to shape up or ship out. If she can't solve this maritime mystery the clever killer could send Polly's whole career--and even her life--overboard.